The Chicagoland area is facing a dilemma regarding the public transportation infrastructure in the 21st century. Chicago’s infrastructure is severely dated and in need of repairs and expansion. While there have been recent updates on some rail lines, the Regional Transportation Authority—which oversees the Chicago Transit Authority, the Metra rail system and Pace suburban bus network—is frequently faced with a budget crisis. In the past four years, the CTA has borrowed $544 million and also provided $100 million worth of free or discounted rides. Pace is siphoning off the same pool of money and arguably plays a more important role due to its overall coverage. If we want to compete for extraordinary events like the Summer Olympic Games, we must have a world-class public transportation system comparable to not only the best in the country, but also the best in the world. Although there are and will continue to be challenges in reaching this long-term goal, things are not all doom and gloom. Since Mayor Rahm Emanuel has taken office, there seems to have been a culture shift with a more aggressive approach towards fixing Chicago’s public transit infrastructure along with a push to increase ridership. For the former, Emanuel appointed Forrest Claypool as head of the CTA and brought in Gabe Klein from D.C. to take over the Chicago Department of Transportation. Claypool has been instrumental in shedding light on CTA’s crumbling infrastructure and rolled out various proposals to improve the system. Klein created the largest bicycle-sharing system and made major changes to D.C.‘s public transportation in short period of time. 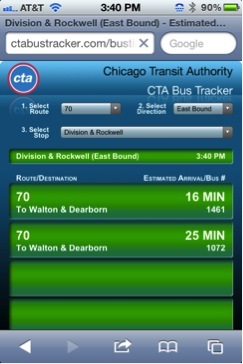 For the latter, the CTA developed two smartphone applications, one of which is designed to track CTA buses through the use of a GPS system, which from my experience is very accurate. The other is designed to track trains’ approximate arrivals. Finally, in September of last year (2011), Emanuel and Claypool announced a proposal to provide renovations to 100 stations over the course of 12 months. The suburbs present an entirely different challenge as more people tend to commute by way of automobile because of the expansiveness of the geography and the convenience of driving. However, the RTA has taken measures to combat the reliance on cars by providing two modes of public transportation. First, the Metra commercial rail system covers a 3,700 square mile northeastern Illinois region, a massive coverage area in which rail provides transportation to and from the suburbs and Chicago. Pace bus routes provides transportation throughout the suburbs within an area of 3,500 square miles, making it one of the largest in North America. As indicated, there are plenty of options for public transportation; however the overall transit system within the Chicagoland area lacks one very important element, cohesiveness. Shifting the focus to Schaumburg—which has been characterized as an “edge city” rather than a garden-variety suburb—reveals it to be a vital cog in the suburban landscape. The city boasts the 9th largest retail mall in America, Roosevelt University, Motorola’s corporate headquarters and another higher learning education facility, Harper College, within a few miles of the city. Yet the CTA has not yet expanded rail service to this area, despite the potential of providing a number of benefits. For one, this would increase access to Schaumburg by residents of surrounding suburbs and Chicago. As noted in my SFF blog post from March 24th, 2012, in 2002 the CTA once considered Schaumburg an integral part of a proposed Blue Line expansion. 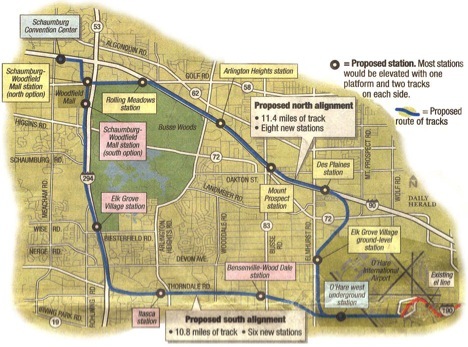 The proposal contained two stops in Schaumburg compared to one in each of the other suburbs involved in the route, a direct reflection of the importance Schaumburg holds as an emerging city. Not to be overlooked, this would have benefited the surrounding suburbs and helped reduce greenhouse gas emissions by adding an alternative mode of transportation. In addition, the lack of cohesiveness regarding the current transportation infrastructure would have been somewhat resolved by providing a direct route to O’Hare. Moreover, by providing a direct, efficient route to Schaumburg, the Blue Line extension would give the city another sustainable transportation option and help reduce greenhouse gas emissions. Finally, this would most likely result in a boon for the local economy as the consumers who may have resisted traveling to Woodfield Mall due to traffic and parking congestion—particularity during the busier seasons—would be more apt to make the trip. Consider all of those positives and then attempt to quantify it employing a trip to O’Hare airport as an example of public transportation providing real value for residents of Schaumburg. During peak hours (Monday through Friday from 6:00am-9:00am and 4:00pm-7:00pm) the maximum fare for a CTA ride is $2.25 plus a $0.25 transfer fee. An average taxi fare from Schaumburg to O’Hare is $36.00, for an immediate cost savings of $33.50 without factoring in a tip for the cabdriver. Again, this is one example; however, consider the benefits the expansion would provide for the additional suburbs and rush hour commuters. Finally, focus on the intangibles— such as the effect on air quality—as we have a tendency to overlook these, one of the various lessons learned in this course. Let us dive deeper and continue to use O’Hare as an example while calculating more numbers. As previously mentioned, this will reduce greenhouse gas emissions due to the reduction of cars on the road. Per this greenhouse gas emissions calculator, using one automobile for a round trip from Schaumburg to O’Hare airport equates to buring 1.4 gallons of gasoline which translates into 0.07 barrels of oil causing 27.2 pounds of greenhouse gasses. These numbers may not look significant but on a larger scale think about the damage being done to our local environment when you consider that O’Hare is the fourth busiest airport in the world. Thousands of people potentially are affected by this one small example.